I thought I’d write a quick postmortem of my recent Ludum Dare entry, This Precious Land. For those who don’t know, Ludum Dare is a 48-hour game creation competition. A theme is given at the start of the time, and all art, audio and code must be created in the time frame by one person. (There’s also a 72-hour team version of the competition with less strict rules). I woke up to the theme – Tiny World – on the Saturday morning (I live in the UK so the competition fits nicely with my time zone and takes place across two solid days). 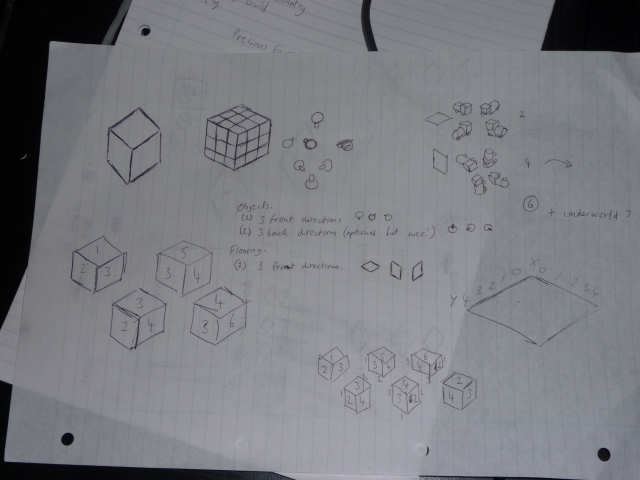 I started sketching some ideas and stuff, and settled on the idea of doing some sort of puzzle game set on a tiny cube. As the engine I’m using is 2D only, I was thinking along the lines of showing various isometric views of the cube on the screen, to show all sides of it at once. I did some mockups. Then I thought it all over in the shower and came to the sensible conclusion that I was overcomplicating the whole thing. Not only would the co-ordinates and stuff be a pain to manage, and the rendering awkward, but I’d have to draw objects from quite a few angles each for the various views involved. So I stripped it right down to a simple single-plane isometric game. Once dressed and back to work I was able to get the basic grid system and rendering done really quickly. Then I could move onto gameplay. The majority of my previous Ludum Dare entry was also thought up in the Saturday morning shower. Which brings me to..
I’m a firm believer in giving my subconcious time to process things while I’m doing other stuff. It’s amazing what you can come up with when you’re not trying. So even during a short competition, I like to have the aforementioned long shower, go for walks, cook and eat properly, and go to sleep at the normal time on Saturday night. As well as having time to step away from the game and think it over, it makes the whole weekend generally more enjoyable. Less chance of burning out. I spent most of Saturday at the Coventry Ludum Dare jam. In the end there was only two of us. I tried to connect the laptop to the wifi there, but it wasn’t happy with it for some reason. This actually worked out extremely well, as I just got in the zone and made tons of progress when it was most important. After about 8 hours at the jam I went home with a mostly playable game, and added the rest of the content pretty comfortably on Saturday evening and Sunday morning. I didn’t have a solid idea of how the game would play before I was almost finished with it. To be honest, I actually prefer to work this way, and in a 48-hour competition it’s pretty much necessary anyway. In the case of This Precious Land though, it meant I never came up with an actual in-game goal for the player to aim for. I considered a few different possibilities: some sort of scoring system; a threat of some kind which acts as a time limit; in-game opponents or something. In the end the easy option was to leave the game as a sandbox where the player just creates a landscape they are proud of. I quite like the optimistic vibe behind this goal, and the freedom it offers the player – I found I enjoyed setting myself challenges to try within the game, for example creating an entirely non-military village, or only using forest tiles, and not leaving any poor-looking level 1 tiles on the grid at the end. So luckily I think it turned out OK, although it could have fallen apart towards the end just as easily. I didn’t make any plans for testing the game, and it basically got none. Draknek played it very briefly during the jam on Saturday, and we talked about the design while I was working on it, but other than that no-one else saw it. Bugs-wise there wasn’t an issue, as I managed to keep the code pretty solid throughout. The game could have done with more balancing, though. There are a lot of values kicking around in the game – resource costs for building tiles, the resources gained from harvesting them, the size of the grid, etc. I just had to make educated guesses about what would work. Originally the jam was intended to take place on both days of the weekend, and with more people involved, which would have helped. I could also have turned to the internet for testing, but I think seeing people play the game in person is far more useful. I’m really proud with how the game turned out. Other people seem to be enjoying it so far too! I’m looking forward to the next Ludum Dare, and in the meantime there are 1400 other entries to play. Very useful write-up, Craig. I certainly should start acting on the “Take it Easy” bit! Just wanted to say: great game! I am enjoying it a lot. Even got the wife and friends to play it. I have already used all the different tiles a player can get, and I would really like to be able to expand it, have a larger area to play in, maybe some more tile-chains. Would you mind if I do this? I downloaded the source code and I was thinking about giving it a try in a week or two (currently working on my thesis). Thanks! Especially good to hear you’ve got other people to play it too. 🙂 Feel free to tinker with the game for your own amusement, though please email me if you’re thinking of releasing anything publicly. It should be easy enough for you to add stuff, just put new things in the enums and XML. The only hardcoded mechanic is the behaviour of the large trees drawing in water.